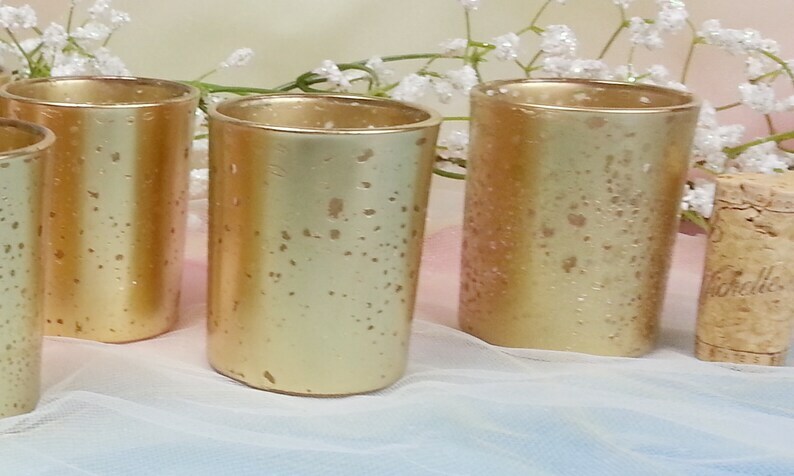 Custom Silver or Gold Mercury or Rose Gold Mercury Votive Candle holders. Painted on the outside. 30 in this order Order as many as you wish. It's Wedding Season. Silver Mercury painted on the inside. If you would like it painted on the outside ... I can do that. - just email me with your details and I will accommodate. All of our Votives Holders are hand painted. Each votive is a one-of-a-kind. There will be slight variations in color. The silver Mercury is not a heavy mirror finish. These are slightly larger than most votive holders. I reserve the right to cancel any order if I am not able to fulfill it. I also reserve the right to invoice you for extra shipping charges. If you do not agree, you have the right to cancel the order. Love them and will be a perfect touch to our wedding reception! Quick and they followed up with me advising of when they would be sent out.